Buying from FullFloater.com is secure. Why is shopping at FullFloater.com secure? All transactions are done through PayPal. 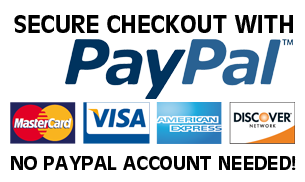 FullFloater.com passes the dollar amount through your browser session and PayPal does the actual monetary transaction. No transaction information is stored here, other than if the payment was successful. Your contact information is stored only for customer support purposes. If you would ever like your contact information removed from the database, please send an email to info@FullFloater.com. – Your credit card information is not stored or passed here. – Your contact information will never be sold or disclosed to anyone. – Website security and functionality maintained by professionals. FullFloater.com is the sole owner of the information collected on this website. FullFloater.com only has access to and collects information that you voluntarily give us via email or other direct contact from you. FullFloater.com will not share your information with any third party outside of our organization, other than as necessary to fulfill your request, e.g. to ship an order. You may opt out of any future contacts from us at any time. – See what data FullFloater.com has about you, if any. – Change/correct any data FullFloater.com has about you. – Have us delete any data FullFloater.com has about you.